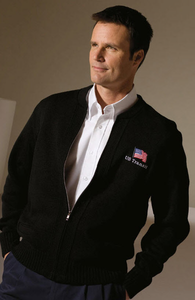 Whether you work front desk or in a transit station, Sharper Uniforms has the right style, fabric and color sweater for you! A sweater is a great alternative to a blazer or suit jacket. It completes a tailored work appearance while maintaining a comfortable and more casual feel. A sweater allows your employees to maintain a nice, flexible range of movement but it also assists in keeping a tailored, polished appearance. Keep in mind that we have embroidery options to customize your sweater to suit your business needs at SharperUniforms.com!